In the digital world, companies are finding it challenging to hire the right employee who takes their business to greater heights. Finding the perfect candidate for a particular project is difficult. When you are caught up in this situation, you can opt to hire freelancers online. For businesses, outsourcing their work to freelancing sites carries many benefits such as high-quality work, flexible & cordial relationships, affordable work rates and so on. Moreover, you don’t need to provide them with office space and other office requirements such as system, internet, etc. They are going to perform freelance work from home. Apart from that, you don’t need to take care of external expenses for them such as cab facility, food coupons and on. You can easily complete your projects efficiently through freelancing websites. All you need to do is to tell your requirements over the internet or phone, and that’s it. The freelancers will perform their job and deliver the assigned work to you on time. How do I hire the right freelancer for my business? Even in outsourcing, you need to spend some time researching freelancers online who are experts in their field and suitable for your project/ business. Follow these simple steps, and you surely know how to move ahead! Identify the job you want to get it done from freelancers: The best freelancing jobs include designing and developing a website, social media related jobs, content writing, app development, scheduling meetings, creating presentations, etc. Analyze and decide what type of freelancer you want: Filter the freelancer based on specifications that you created for your particular project. Don’t hire freelancers in a hurry: Go slow and steady. Conduct interviews and check out their ability to work on the project. Business clients can arrange interviews via phone, skype call or some other internet medium. When you are thoroughly convinced, then only take the next step to hire them. Apart from that, you can give them a trial project to work on to find out their capability to work with you on your project. Always make sure that you are very clear in your communication and decisions: If the work done by freelancer is good, you should let them know of their excellent job and how much you appreciate it. If they fail, you should give genuine and helpful feedback. Even then, if there is no improvement in the work output, then it is best to end your professional relationship with the freelancer after letting them know why it’s not working out. Should I sign a contract with freelancers? A wise initiative to start work relationship with a freelancer is to sign a contract. Most freelancing websites allow you to have a contract online where all the mandatory elements are listed. The written contract should include the terms & conditions of the co-working relationship, the payment rate for the freelancers, the services that they will be providing and the number of hours in which they will be completing their work and so on. Apart from that, if you do not want the freelancer to disclose anything about you or your project, then make them sign the confidential agreement where it is clearly described what they can share and what they cannot. Make sure that they are aware of the fact that the contract is confidential and they cannot share it with anyone. Find trustworthy, dependable and talented freelancers and sign agreements with them before you start on a project together. These are some necessary steps which when appropriately followed, makes your way smooth to search the right freelancer who will be beneficial to your company. 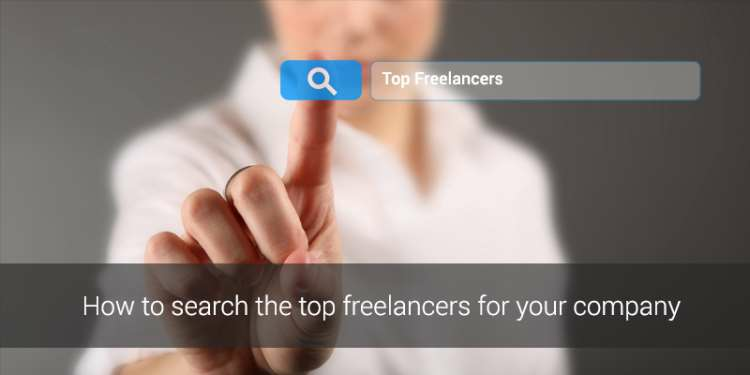 What steps do you follow when looking to hire freelancers online? Do share with us in the comments below!